“YOU. ARE. A. TOY!” Remember Sherriff Woody’s frustration as he has to remind Buzz Lightyear multiple times in Toy Story that Buzz is in fact a child’s play-thing?! Well, Woody has been at work behind the scenes making sure the thousands of guests arriving this summer also believe they are in fact entering a new land as a T-O-Y. So, grab all your accessories and spare parts and get ready for an unforgettable playtime this summer at Walt Disney World! There’s no “snake in my boot”, but we still can’t keep from being giddy with excitement that Toy Story Land is opening in Walt Disney World’s Hollywood Studios on Saturday, June 30, 2018. We are just thankful an opening date has been released so we can get to planning right away! If planning to head to Hollywood Studios on or shortly after June 30, you can expect LARGE (very large, Rex style!) crowds to be flocking to Toy Story Land for some time. Think about trying to make an early breakfast reservation in the park before the park officially opens to get in before the rush does. Be sure to wrap up breakfast before the park opens for the day. Last summer when Pandora opened there were long waits, as much as an hour or more, just to get into the new land. Expect the same for Toy Story Land. We expect Disney will set up queue areas for guests waiting to get into the land. Much like we saw last summer with the opening of Pandora-The World of Avatar over at Disney’s Animal Kingdom, Disney is planning on extending park hours at Disney’s Hollywood Studios for the month of July. On the opening day, June 30, 2018, Hollywood Studios has published hours of 8 am – 11 pm. The entire month of July has published hours of 8 am – 10 pm daily. For Disney World Resort guests, the park will open at 7 am for morning Extra Magic Hours for the entire month of July. For now, no evening Extra Magic Hours have been scheduled for July. The park hours for August 1-18 move to 9 am – 9 pm with morning Extra Magic Hours of 8 am – 9 am on Sundays only. Keep in mind that operating hours may change as we get closer to the summer. Always check for official hours in the My Disney Experience App or on the Disney World website. 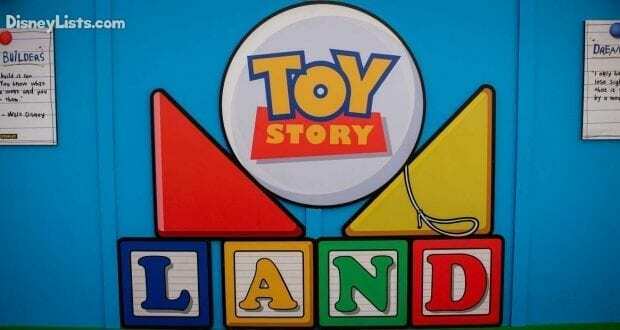 When Disney Pixar released the first Toy Story in 1995, it was an instant success. The popularity of toys coming to life, interacting with one another, and setting off for adventures was a new experience for us film watchers. The popularity triggered two more films – Toy Story 2 (1999) and Toy Story 3 (2010) – along with a huge following of Toy Story fans. Woody, Buzz, Jessie, Rex, Mr. and Mrs. Potato Head, Slinky Dog, Barbie and Ken, and even Lotso… each of Andy’s toys has something to bring to playtime and offers memorable and mostly lovable personalities! Our childhood imaginations were perfectly played out in these films. Toy Story 4 is set to be released in 2019 promising even more fans for years to come. Disney is brilliant for embracing this firm fan base that will flock to any and all things Toy Story! As Andy’s Army Man Sergeant says, “A good soldier never leaves a man behind!” The extremely popular Toy Story Mania attraction that opened at Hollywood Studios in 2008 is staying put, but the entrance is moving to be within Toy Story Land. The entrance will be an all-new colorful toy carnival game box entrance when the new land opens. In fact, this is the box that the Toy Story Mania! game came in. This entrance relocation only makes sense in our opinion so all of the Toy Story attractions can be in one designated land. The current Pixar Place will be closed off and become a backstage area. Just keep this in mind before you go rushing to the attractions at park opening! A new park map or your My Disney Experience App will be very handy. While Hollywood Studios is growing, this 11-acre expansion of Toy Story Land is being themed to make guests feel as if they’ve been shrunken down to the size of a toy to take an adventure through Andy’s backyard. We are especially excited to hear that while exploring Toy Story Land guests will encounter Andy’s toys throughout the land. The good news is we won’t have to be worry about being caught playing by Andy, as the storyline says he’s away so the toys are out to play. They say you’ll spot Army Men keeping watch, just in case! Toy Story Land will also celebrate what once defined entertainment for a generation. Crayons, Rubik’s Cubes, Cooties, Green Army Men and other toys and games will pour on the nostalgia for park-goers. Even the lampposts will be shaped like Tinkertoys. 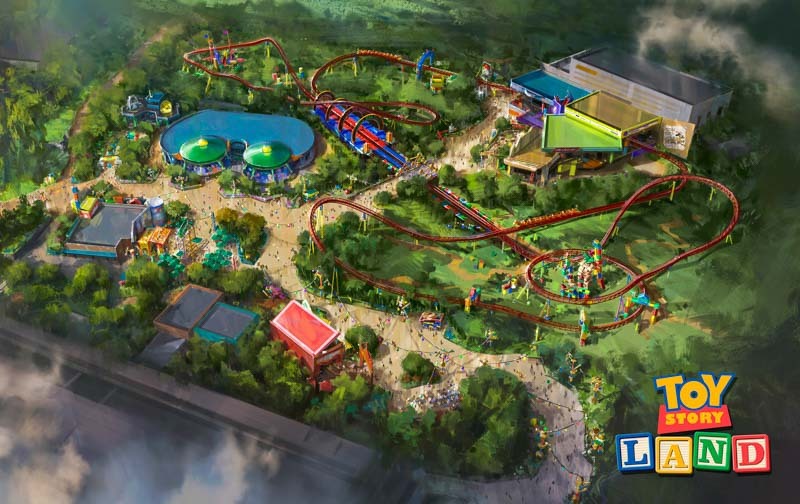 “With set pieces, staging, attractions and experiences Toy Story Land represents the best of Walt Disney Imagineering’s collaboration with our storytelling partners at Pixar Animation Studios,” said Bob Chapek, chairman of Walt Disney Parks and Resorts. “This new land will place guests inside the wondrous world of Woody, Buzz and their pals – and invite everyone to experience the joy of being a toy.” One of the very best ways to check out the land in advance of opening is to visit Walt Disney Presents (formerly called Walt Disney: One Man’s Dream) in Hollywood Studios where Toy Story Land models are currently on display. The highlight attraction in the new Toy Story Land is definitely the Slinky Dog Dash. Slinky Dog is a beloved character from all of the Toy Story films and is an obvious favorite of Andy’s and especially great friend to his pal, Woody. Slinky Dog Dash is a called a “family-friendly coaster” and has a height requirement of 38 inches, which is the same as Seven Dwarfs Mine Train at Disney’s Magic Kingdom. Young and old alike can enjoy this coaster. The attraction is said to stretch across Toy Story Land which will be great for getting the lay of the land while on a fun adventure. Join with your family as you “reach for the sky” with Slinky Dog leading the way! Remember those cute green Alien’s picked up from Pizza Plant in the Toy Story film? They were especially fond of “The Claw” and eager to be selected by it! It sounds like Alien Swirling Saucers in Toy Story Land will include some spinning but in a mild way as you hold tight to your space rocket which is driven by an Alien. They say someone will be lucky enough to be selected by “The Claw” during the ride through this Alien space. We don’t mind being selected by “The Claw”… as long as we don’t have to go home with Andy’s evil neighbor kid, Sid! The height requirement for this attraction is 32 inches. At Disney’s Hollywood Studios, Epoct, and Disney’s Animal Kingdom Disney has attraction grouped into two different tier groups. Guests can only select one attraction from Tier 1 and two Tier 2 attractions. As we expected, both Slinky Dog Dash coaster and Alien Swirling Saucers are in the Tier 1 category. Toy Story Mania also remains in Tier 1 making all three Toy Story Land attraction in Tier 1. All other FastPass+ attractions in Hollywood Studios are now in Tier 2. This means guests can only reserve one Toy Story Land attraction for their initial 3 reservations for the day. If your budget allows we recommend at least two days set aside to visit Hollywood Studios so you can spread out your Toy Story Land FP. For the day your arrive without a FastPass for a Toy Story Land attraction, expect long waits. Generally the earlier you arrive the shorter the wait will be. We also recommend that you make your FastPass reservation as soon as your window opens at 7:00 am EST. Make your Toy Story Land FP reservations first before any other parks. Also, look for FP availability at the end of your vacation first and make those reservations first. For example, if you arrive on a Sunday and are staying the full week, make your reservations on your last day (Saturday) first and make your way backwards making reservations until you get to your arrival day. Every toy needs a good meal to keep their energy up during playtime! Join Sherriff Woody at his lunch box for a quick-service, walk-up window style eatery for on the go ordering and quick food. Breakfast, lunch, and dinner will be served with an American cuisine partnered with old-fashioned soda floats that we are especially eager to try! Walt Disney World is partnering with Mini Babybel which leaves us curious as to what will be on the menu that will likely feature Mini Babybel in one way or another. Another hope we have for Woody’s Lunch Box is that it will be added to the great line-up of Mobile Ordering locations via the My Disney Experience App. This would be the most ideal way to beat the crowds we suspect will gather at this eatery. Check out the menu and photos of what you can expect here. 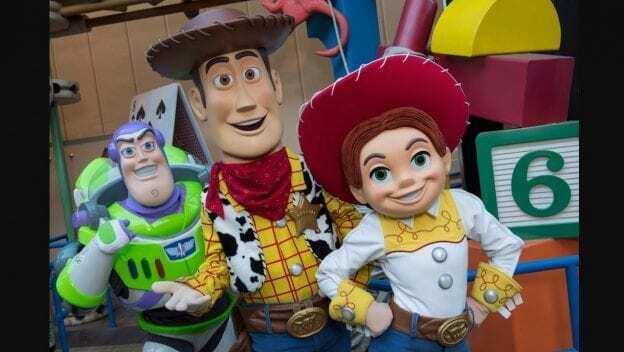 You’ll have the chance to encounter some of your favorite characters from the Disney•Pixar “Toy Story” films, including Sheriff Woody, Buzz Lightyear, and Jessie the Yodeling Cowgirl. Woody, Buzz and Jessie will be greeting guests throughout Toy Story Land on a daily basis. We’re especially to happy to know that fan favorite Jessie, who has been missing from Magic Kingdom, will be present in the new land. We can’t wait to share more details about Toy Story Land as they unfold in the upcoming months. In the meantime, start planning your summer trip “To Infinity, and Beyond”! Cindy N also contributed to this article.